The Milestone® Mastercard® is a good card to own for those of you that have "less than perfect credit." There's two versions of a real Mastercard® (not a secured card! ), one for those with average credit, and a second option if you have bad or no credit. In both cases, you may be approved even if you have a prior bankruptcy. Is the Milestone® Gold Mastercard® for you? In this guide, we're going to break down the pros, cons and everything in between to see if this credit card makes sense for you. Here's our updated (May 2018) Milestone® Gold Mastercard® credit card review. If you have good or fair credit, or suffered a previous bankruptcy, we think that the Milestone® Gold Mastercard® offers you the best option for a true, unsecured credit card. This is a real Mastercard® - meaning that this card is accepted at 35 million locations worldwide - which is pretty much everywhere. On top of that, this card reports to all 3 major credit bureaus. This will help you build your credit scores consistently as long as you're making your payments on time. As indicated above, there are two versions of the Milestone® Gold Mastercard®. They both offer the same benefits, and have the same fee structure. And you can apply for either, regardless of whether you had a prior bankruptcy. What's great about these cards is that you can request to be pre-qualified before applying. It only takes a few minutes to see if you're pre-qualified. And, since it is a "﻿s﻿oft" credit check, seeing if you are pre-qualified will not impact your credit score. While their pre-qualification tool does not guarantee your approval, if you qualify there is an extremely good chance you’ll be approved when you apply. Even if you are pre-qualified, you will not be obligated to take out this card. So there is no harm in checking. If you are interested in seeing if you pre-qualify for the Milestone® Gold Mastercard®, just click here. Why Else Should I Apply? It is nice that Milestone® Gold Card accepts applications from those with limited credit history, fair credit, or a prior bankruptcy. But what if you have average credit? Is there also a reason to apply? The Milestone® Gold Mastercard® reports to all three major credit bureaus. This gives you the chance to establish a consistent payment record while enjoying the convenience of a credit card. Plus, this card can be used anywhere that Mastercard is accepted (which, of course, is millions of locations). This is not just another catalog card, like so many other cards marketed to people with credit issues. For anyone trying to get back on their feet after some credit mistakes, or otherwise establish their credit profile, we recommend the Milestone Gold Mastercard®. And remember, when using this card, establishing a good payment record may help you qualify for better rates on mortgages, car loans, and other forms of credit. Regardless of your credit rating, the Milestone® card offers a 23.9% APR. But make sure you pay at least the minimum amount due monthly by going into the milestone credit card login. Consistency is what will improve your credit score over time. The annual fee for the card will vary depending on your credit profile. The fee starts at $35 and goes as high as $99. If you qualify for the lower fee, be forewarned that is for the first year only. After that, the annual fee increases to $99. However, if you are able to improve your credit, you may be able to get that fee increase changed. Best of all, there are no hidden fees with this card. You may not have heard of the Milestone® credit card, but it is issued by two respected companies. The Milestone® Gold Mastercard® is issued by Mid America Bank & Trust Company in partnership with Genesis Bankcard Services, Inc. Mid America Bank & Trust Company is a FDIC-insured bank based founded in 1920 in Dixon, Missouri. Genesis Bankcard Services, Inc., and its parent, Genesis Financial Solutions, service Mastercard® accounts nationwide. They specialize in helping those with limited or damaged credit. We consider the Milestone® Gold Mastercard® to be the one of the best credit cards available today for applicants looking to establish a consistent payment record while enjoying the convenience of a credit card. You'll have the opportunity to grow with your Milestone® Gold Card as long as you're making your card payments on time. The Milestone® Mastercard® also has a 25 day grace period. If you're approved, you'll receive a minimum $300 credit limit on your Milestone® card. The one downside is that your annual fee will be applied to your card immediately, which will reduce your total balance. The annual fee you’re charged will be $35, $59 or $99 depending on your creditworthiness. Now, there's also a small fee to add an authorized user to your account. If you choose to do so, that fee will be applied immediately. Even though you can add a new user to your card, it's not mandatory. We love that you can check if you are pre-qualified without affecting your credit score, that it is a real Mastercard, and that it reports to all three major credit bureaus: Equifax; Experian; and TransUnion. This allows you to demonstrate responsible credit use to other lenders and helps to establish or re-establish your credit scores by using use your card responsibly and paying your bill on time each month. On top of that, you can apply even if you have a bankruptcy on your credit report. 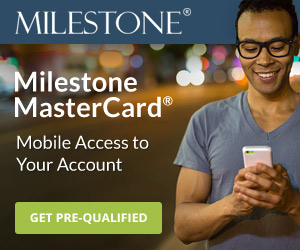 I think it's worth your time to at least check if you're pre-qualified for the Milestone® card. Remember, it will not impact your credit score. and you'll not be required to apply.